François "AMANEK" Delaunay joined G2 Esports' Counter-Strike: Global Offensive lineup, the team announced Thursday. AMANEK will replace Alexandre "bodyy" Pianaro in the G2 CS:GO starting lineup once he and the team have finished competing at the WESG Finals in China. Frags. Wins. . @g2amanek will help us with all three. Please welcome him to the #G2ARMY! 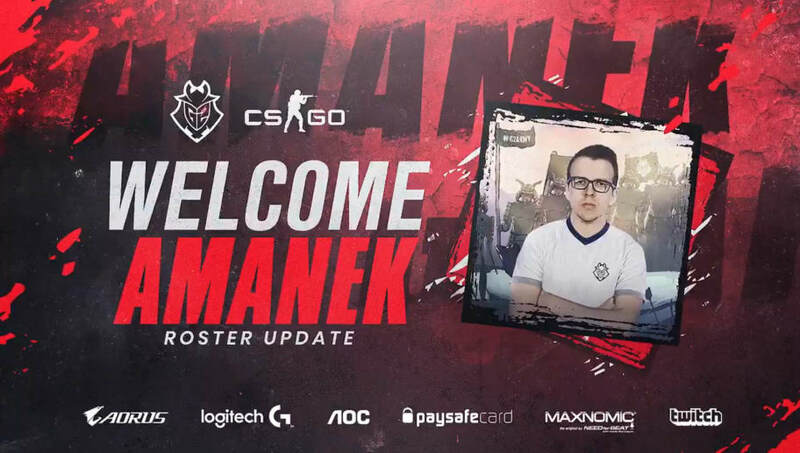 AMANEK has played CS:GO professionally since 2016, but is likely best known for his time with Misfits starting in 2017, and with Team LDLC from 2018 through January, 2019. Team LDLC's achievement peaked in November, when it defeated Renegades, North and NRG Esports to place 5th-6th at IEM Chicago. In a statement accompanying the announcement, G2 CEO Carlos "ocelote" Rodriguez explained the decision. "In our quest to be number one in CS:GO," he said, "we are on the lookout for opportunities to improve our lineup. The moment we realized AMANEK could improve our team and help return it to winning form, we decided to move forward with haste. We’re deeply confident in our current upwards trend and are convinced that AMANEK will return French CS:GO to its former glory."